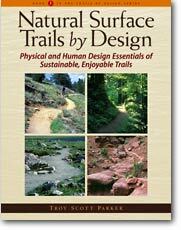 Our book, Natural Surface Trails by Design: The Physical and Human Design Essentials of Sustainable, Enjoyable Trails, presents the keys to a comprehensive trail development process. The series addresses the longstanding need for a simple yet profoundly powerful trail design system that anyone can use to design and develop sustainable and enjoyable natural surface trails for any trail type and use. Natureshape LLC provides the following consulting services. Trail systems and individual trails for most trail types and uses (hiking, horse, biking, ADA, ATV, motorcycle, ORV), and locations. We work closely with the client, site, and visitors, focusing on maximizing the trail experience while minimizing the budget. Forming naturalistic, detailed, sustainable, enjoyable, low-impact, context-appropriate trail systems is what we do best. Our design method and philosophy. Please note: We do not consult on mountain bike skill parks, downhill mountain bike trails at ski resorts, trails used for racing or competitions, trails used solely for snow sports, or projects in which a) trails are used more to support a sport than for general recreation and b) the site, its natural features and the visitor's experience of nature are considered to be of secondary importance to the trail itself. While Natural Surface Trails by Design and trailshaping work well for these types of projects, we choose not to consult directly on such projects. Training in trailshaping, an exclusive, highly effective, not-yet-published system of thought for working with any type of trail as a generative, comprehensive, horizontally and vertically integrated process. Trailshaping extends and improves the foundation presented in Natural Surface Trails by Design, but using a different model with tighter integration with trail planning, design, construction, maintenance and management. Training is held entirely or almost entirely outdoors on your site for groups of 15 or less. Multi-day trainings are most effective because expertise requires time and hands-on practice. Training focuses on using trailshaping for trail planning, layout, design, prediction, evaluation, problem-solving, and learning how to comprehensively understand your own context and generate context-appropriate solutions within it. We typically examine your site(s) and practice trail planning, layout, design, evaluation, and prediction in the field, including flagging "practice" trails, but do not perform physical trail construction or maintenance work during trainings. Because we focus on optimizing the thinking process of trail experts, both novices and experienced professionals can learn from the same training at the same time. Hence your group can have a wide range of skill and experience levels, and all will benefit.